via Fitness and Karaoke Party in Milpitas, CA!. We Won!. Thank you to all that voted for me as one of the Best Fitness Trainers in Milpitas. The winners were published in the Sept 26th issue of the Milpitas Post Newspapers. Fun Run – San Jose, Milpitas, Santa Clara, Sunnyvale, and Fremont Residents. All South Bay residents are invited to this wonderful event of Fresh Air, Friends, Fitness, Fun, and Food Snacks. This is the Third Annual 5k / 10k Fun Run, Walk, Jog Event by Skip Hicks and Reciprocal Energy Fitness. Saturday, September 27, 2014 will be the big day. Start times are 8:45 AM for the 10k and 9:00 AM for the 5k. Commemorative (dry mesh material) event shirts, fresh bottled water, and food snacks are included. PROFITS WILL GO TO THE AMERICAN DIABETES ASSOCIATION. Rock My ABS… Rock and Hold… AB-Attack Phase II. Get over the Bad Bothersome Belly Blues. Let’s get moving. It’s time to pay our dues. This is for women, men, the young and the old. 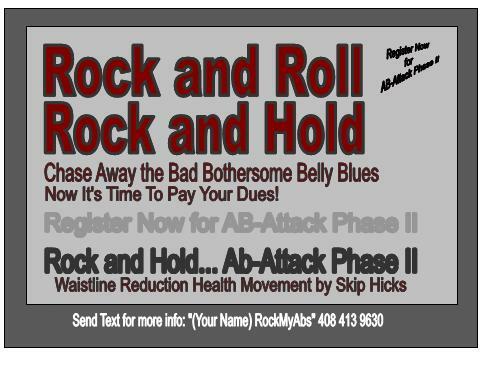 Skip Hicks and Reciprocal Energy Fitness are going to show you how to Rock and Hold! Register to become part of a mass fitness movement where participants will motivate and inspire each other. Our final goal is a smaller but stronger abdominal area. This is a 28-day challenge which requires a daily commitment to perform and report your completion of at least one minute of abdominal exercise. Media recognition will be given for noteworthy efforts and results. Motivational messages, status reports, and the Rock and Hold video will be sent to your smart phone. There will be an in-house registration event at Reciprocal Energy Fitness on Monday, June 2, 2014. You can also register electronically by texting: “(Your Name) RockMyAbs” to 408 413 9630. Tell all of your friends, family, and associates. This is a FREE Wide Area Network health and fitness event. It does not matter what United States city or state you happen to be in. Anyone 18 years or older can participate. Text messaging capability required. One should consult their physician before starting any new exercise program.